One of the best things about San Francisco in my humble opinion is Golden Gate Park. It feels like the city’s backyard, with 1,017 acres of public gardens, fields, playgrounds, trails, museums, and sports facilities. It can also be overwhelming to know where to start exploring, so choosing to go on one of the Golden Gate Park tours either guided or self-guided can be a very wise decision indeed. Where is Golden Gate Park? The park is the unofficial divider between the Richmond and Sunset neighborhoods, with Fulton Street running down the north end, and Lincoln Way down the south end. On the east end, there’s the Great Highway across from Ocean Beach, and Stanyan Street in the Haight-Ashbury neighborhood on the west end. It’s important to dress in layers, since the weather in the park can be unpredictable to say the least. It can start out sunny and then an hour later the fog rolls in and you need to pull out your down jacket. Do not be fooled during the summertime, since this is one of the coolest, foggiest seasons in the park and you will regret leaving your jacket at home. There is plenty of street parking, but on the weekends some streets are closed, so one of the best places to find spots is around Stow Lake. There is a path from right behind the Japanese Garden that goes to and from Stow Lake for easy access. There’s also a paid underground parking lot by the Academy of Science, but it’s not worth the price since there’s plenty of free parking. Even if you can’t find parking within the actual park you can always find it nearby in the Inner Sunset or Inner Richmond neighborhoods and easily walk over. Some Golden Gate Park tours include the scenic west side of the park. Zip around 7 miles of the park on two wheels with an expert guide from San Francisco Electric Tour Company, who will show you the most popular sights in the eastern sections of the park, including the deYoung Museum, Academy of Sciences, Shakespeare Garden, Stow Lake, and Rose Garden. You don’t need any previous riding experience, since there will be an in-depth training and practice time before heading out on the road. Tours cost $75 and are 2.5 hours long. The San Francisco City Guides is a company that gives donation-based tours all around the city, including several in Golden Gate Park. Choose from tours within the park such as West End, East End, Stroller Walk geared toward younger families, and American History that focuses on the historical side of the area. Most of the tours are given year-round, one day a week, usually on the weekend. For those who prefer to venture out on their own, here’s a great Golden Gate Park map to refer to that shows the layout of the entire park. There are numerous biking paths throughout the park, and a few road in the western part of the park are closed to street traffic on Sundays, allowing bikers to take over. Avenue Cyclery is a reliable bike rental on Stanyan Street right next to the park. If you prefer to just walk around on your own, the best place to start is at the McLaren Lodge on Stanyan Street and pick up a detailed map or talk to a park ranger if you have any questions. Below is a list of places that are worth stopping at whether you are on foot or on a bike. Starting at McLaren Lodge, the following sights are mapped out for easy access from one to the next. Spot tropical blooms within the numerous indoor plant galleries. The lawn outside is an ideal spot for a picnic among the flowerbeds. The first Tuesday of every month is free. This space is one of the most sacred spaces within the park, remembering the millions of Americans who were affected by the epidemic. The grove is located in the de Laveaga Dell, which provides an outdoor sanctuary of oak trees and a small stream. There are free guided tours that are given each month open to the public, except in winter. This scenic outdoor space between the deYoung Museum and Academy of Science is a great spot to grab a seat on one of the green benches and take a break. If you’re hungry there’s usually an assortment of food trucks behind the Bandshell. During the summer there are free concerts and local art shows around the main fountain. This innovative natural history museum is highly recommended if you have limited time and can only choose one museum out of the two. Noteworthy sights include a four-story rainforest, the Morrison Planetarium, and the eco-friendly live roof. Come back for Nightlife, a 21+ event where you can wander the museum with a cocktail in hand and enjoy themed activities. An art museum that’s worth checking out if you have the time and are an art enthusiast. If you just want to see pretty views, you can head to the top of the Hamon Tower free of charge for 360 views of the city. You can also use the restrooms on the ground floor without having to pay an admission fee. This is a great spot to relax and wander around enjoying the tranquil grounds with koi ponds, temples and a variety of trees. It can get quite crowded so try to avoid the weekends, or come early in the morning. On Mondays, Wednesdays, and Fridays if you enter before 10 a.m. admission is free. Make sure to stop by their tea house, where you can get a soothing cup of green tea. Whether you want to walk around the entire perimeter of the lake (takes about half an hour), cross over the bridge to hike Strawberry Hill (the island in the middle of the lake) for a panoramic view, or rent a paddleboat to bob your way around the lake, this is a great place to end your tour. The Stow Lake Boathouse Café has delicious food options like veggie wraps and paninis. A large field that is used for an array of sports like soccer, running and horseback riding, and major concerts like Outside Lands in August and the post-race event Footstock for the Bay to Breakers in May. The field is open for walking around the perimeter and is a great spot to join locals who use this as their outdoor track. This artificial reservoir was created for visitors to sail their model boats on and it’s a fun place to watch people show off their mini-boats of all shapes and sizes. Make sure to stop in the San Francisco Model Yacht Club, and see some of the intricately designed model boats up close. A worthwhile stop if you’re in the eastern part of the park. Sometimes the bison are hard to spot, sometimes there’s six of them in plain sight grazing on the grass. If you’re lucky you might see a baby bison. Marking the entrance to the western side of the park, these century-old windmills are great to get up close to and explore. Make sure to stop by the Queen Wilhelmina Tulip Garden at the base of the Dutch Windmill. This historic building is ideal for grabbing a drink at the end of the day with a scenic view of the Pacific Ocean nearby. The restaurant itself is nothing exciting, but the atmosphere is well worth at least a beer or two. 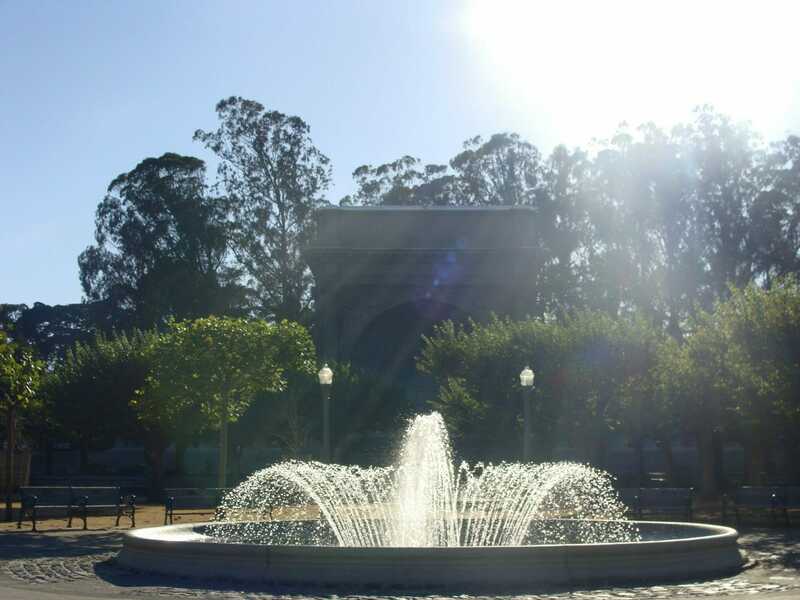 Have you tried any Golden Gate Park tours before? Guided or self-guided?